According to Travis Palmer, his avocation of tuning pianos is a lot like life: bringing things into harmony with their surroundings. Palmer turned pianos for many years, following in the footsteps of his father. 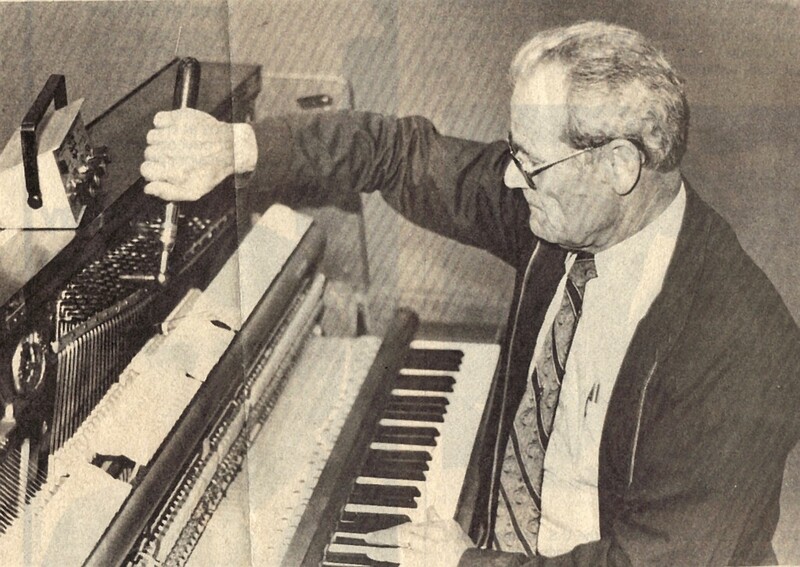 His main project was taking care of the 26 pianos at the Starkville First Baptist Church, where he was a member. Over the years he has also tuned more than a dozen antique square grand pianos throughout Oktibbeha County. He depended solely on his ear and a tuning fork to achieve the perfect pitch in his pianos. However, he learned to trust a more recent device, a solid-state sonar tracker that is even more dependable than the ear. Other tools of the trade included his father’s tuning hammer. Palmer was born in Maben and graduated from high school in Clumberland in Webster County. His family that included 10 children, always enjoyed “hillbilly” music and just about everyone played several kinds of instruments—pianos, guitars, fiddles, and organs. Before he was big enough to play the old pump organ at home, he was in charge of pumping the pedals for his sister. Palmer sang in the choir at Wood Junior College and later took voice lessons from Harrell Biard, a well-known Birmingham vocal coach. Although he had always sung baritone, Biard changed him to tenor—so he is ambi-vocal, singing whatever is needed at the time. After graduating from WJC in 1942, he attended radio school at the University of Alabama for a year. Not qualified for the Army due to a football injury, Palmer moved to Birmingham where he was with the city police radio division until 1947 when he entered commercial radio in Cullman for a year. When Starkville’s radio station, WSSO, went on the air in 1948, Palmer came here as chief engineer. In 1953, he moved to Batesville to build a radio station. One of his partners was James Hartness of Starkville. After two years, Palmer returned to Starkville and WSSO serving as chief engineer and announcer until 1960 when he went into the insurance business. Some of the most vivid memories revolve around his disc jockey programs. There was just about every kind of program imaginable. One of the most popular regular features was “The Groovey Show” which ran every afternoon for over 10 years. Palmer developed quite a following and received boxes of mail from this show. In 1964, Palmer was asked to chair Starkville’s participation in the Mississippi Economic Council’s Merit Community The city was evaluated from all aspects and projects were developed to correct weak areas. For instance, the city’s fire rating was greatly improved by upgrading the fire department. In 1963, Starkville became the third city in the state to be awarded the Merit Community designation. The local Exchange Club named Palmer to receive its coveted Golden Deeds Award for his efforts in obtaining the Merit honor. One accomplishment during his administration that Palmer remembered with pride is the investment of city funds not earmarked for immediate use. That was something new at that time and it helped us leave a pretty good carry-over for the next administration. The introduction of plastic garbage bags was another progressive step to reducing hazards. It sounds humorous but this one thing did more to improve the sanitation department and the services than anything else. It helped eliminate health hazards not only for the community but also for the sanitation workers. A memorable occasion that occurred during his mayoral term that was the Starkville High School Band’s participation in our international band festival in Vienna Austria. Palmer accompanied the group and taped interviews throughout the tour to be played on WSSO. He emceed community and church programs. Palmer and his wife, Ola, attended WJC together. They married in 1944 and are the parents of two children, Toby Lynn and Michael. Palmer was a longtime member of the Rotary Club and is a member of the Five-County Life Underwriters Association. In 1975, he helped organize the Oktibbeha County Board of Realtors and served as its first president. He is also a member of Albert 89 Masonic Lodge. Tours are encouraged and available by special arrangement. Admission to the museum is free, but donations are appreciated.